An enormous wildfire is roaring across the hills of Northern California, consuming land at a rate of 1,000 acres an hour, or more than 12 football fields a minute. The blaze is much larger and more out of control than the other fires that plagued the region last week, and a heat wave will only make conditions more challenging. The County Fire began on Saturday evening, burning a few thousand acres in Yolo County. But gusty winds whipped the flames into a frenzy on Sunday night, spreading the fire into Napa and Lake counties. By Monday morning, the fire had burned at least 44,500 acres, gobbling up 1,000 acres an hour. Despite the best efforts of more than 1,200 firefighters on the scene, the fire remained only three percent contained and mandatory evacuation orders were in place for parts of Yolo County. 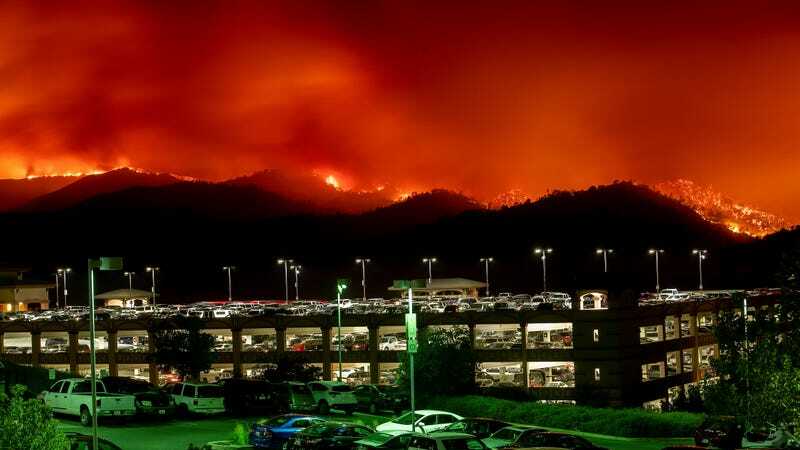 “Extreme fire behavior is still being observed,” Calfire wrote in its morning update. The powerful winds fanning the flames are also steering copious quantities of smoke into the Bay Area. Satellites captured the plume of dusky brown smoke wafting over the marine layer clouds that hug the California coast in summer. Ash settled on cars and windows and obscured views across San Francisco Bay, according to local news reports. The northern half of the Bay Area continues to deal with moderate levels of air pollution today, a trend that will continue through at least midweek. A slight shift in winds also sent more smoke streaming into Sacramento on Monday. None of this is good for public health. The smoke plume from the County Fire as captured by satellites on July 1. The conditions that primed the region to go up in flames are likely to continue this week as California gets a taste of the sweltering weather already cooking the eastern half of the U.S. Large portions of the state will see temperatures well above normal as a ridge of high pressure builds up, centered over the Southwest. Northern California (with the exception of the far north coast) will see temperatures as much as 18 degrees Fahrenheit (10 degrees Celsius) above normal by the weekend. In Southern California, the heat will be even worse. Temperatures could reach 100 degrees Fahrenheit on the west side of Los Angeles, and records are likely to fall. Coupled with dry weather that’s the norm for this time of year, this it means wildfire conditions will be on the rise in Southern California, too. It feels like this type of extreme weather is becoming the norm for California. Last year, the state was bookended by its largest and most destructive fires in history. The Thomas and Wine Country fires came after a series of drought years followed by a near-record wet winter in 2016-17. This year’s wildfire season (if we can even call it a season anymore) follows a pretty dang dry winter. Recent research suggests that the odds of wild swings from extremely wet to extremely dry winters will only increase due to climate change. Climate change has also been implicated in making Southern California’s clouds disappear. And of course, we already know its ratcheting up temperatures everywhere.